Odontoglossum (oh-don-tuh-glos-uhm) orchids are a genus that has approximately 100 species and numerous hybrids which range in bloom size, color, and patterns. where the Odontoglossum orchid genus gets its name. They are cool growers and are almost all epiphytes (air dwellers). The plants will grow from one to three leaves per pseudobulb. The older pseudobulbs will drop their leaves over time but remain plump to serve as support and water retention for the newer growths. Over time a spike will develop from between the pseudobulb and one of the basal leaves. 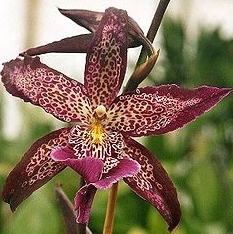 A Odontoglossum orchid should be watered in the morning using tepid water. This will give the orchid adequate time to dry before the temperature drops at night. 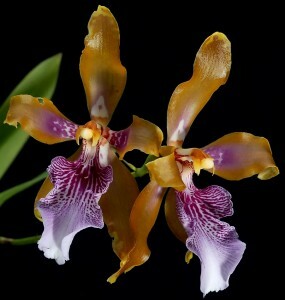 You will want to make sure that you don’t let the Odontoglossum orchid get completely dry between each time you water. These orchids like to be damp, although not soggy. Watering frequency – as covered in this article about watering orchids – can be determined by a few different things. In order to tell if you are not watering often enough you will need to check the foliage. If the Odontoglossum doesn’t have enough water, the leaves will begin to pleat and the pseudobulbs will begin to look shriveled. As covered in this article about orchids care and light, Odontoglossums thrive with medium light conditions. They like bright but indirect light. If your orchid is receiving too much light the leaves may get reddish streaks or the foliage may sunburn. A great inside location to place your Odontoglossum is on a western or eastern facing windowsill or within one foot of a southern facing windowsill. As discussed in this orchid plant care article on temperature, Odontoglossums are cool growers and the temperature requirements for them are daytime temperatures somewhere between 65°F to 75°F (18.3°C to 23.9°C) and night temperatures between 50°F and 55°F (10°C to 12.8°C). Odontoglossum orchids are able to withstand temperatures outside of these requirements for a few days, although exposure to extreme temperatures for more than a few days could prevent the flowers from opening. Odontoglossums thrive in humid conditions between 40-80%. As covered in this “humidity” article on how to care for orchids, if you need to increase the humidity for your orchid, you have several different options such as a humidity tray or humidifier. It is also important to remember that the more humid you keep the orchids environment, the more air movement your orchid will need to help prevent any disease. To help increase air movement an oscillating or ceiling fan is recommended. 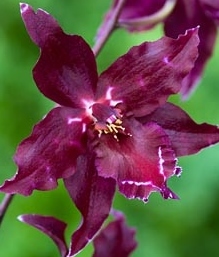 Odontoglossum orchids should be fertilized about twice a month with a diluted fertilizer solution. It is important to never fertilize an orchid that is completely dry because this can cause severe damage to the roots. An orchid fertilizer mix of (20-20-20) is recommended unless your medium consists of bark. If you are growing your Odontoglossum in bark medium you should choose an orchid fertilizer that is higher in nitrogen (30-10-10) because when the bark breaks down, the process uses up a lot of the nitrogen. see new roots begin to emerge. #1 – More Free Odontoglossum Tips! If you’d like to learn everything you need to know about Odontoglossum orchid care (and caring for ALL types of orchids) we also have something called the Orchids Made Easy Green Thumb Club.